Home »Comics»Deadshirt Is Reading… STAR WARS! NOTHING BUT STAR WARS! Thus far, I’ve been very pleased by the generally high level of quality and the renewed sense of playfulness that I felt a lot of the Dark Horse material lacked; Dark Horse’s material was competently produced, but felt pretty stiff in my estimation, whereas the new Marvel books greatly please my inner seven-year-old. Nostalgia, fan-service, whatever. They’re fun. From the very first issue, Kieron Gillen’s handling of Vader has been simply masterful, consistently topping my to-read pile, and artist Salvador Larroca’s slick linework and clever layouts enhance the experience tremendously. Larroca has a knack for taking established Star Wars environments, creatures, aliens, and so forth and putting a new spin on them. And his action sequences work very well. He’s never been a great action guy, but he’s got the feel down cold here. 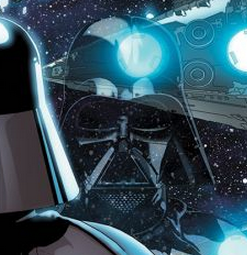 The current issue continues the ongoing wheels-within-wheels plotting of Vader, disgraced and in the Emperor’s doghouse following the destruction of the Death Star, and it serves admirably in that regard. The dialogue crackles along, Vader’s schemes are moved forward, and there are some moments of standout Sith Lord bad-assery (notably, Vader’s location and off-camera single-handed destruction of a Rebel cell for the purpose of covering his tracks). What the issue lacks is some of the emotional, character-driven beats of prior issues—the barely restrained fury and black joy of Vader’s discovery that the Rebel pilot who destroyed the Death Star shared his former last name, for example. In its place, the issue feels very much like a middle-of-the-arc recap, to keep folks current with the current state of play, with only some incremental advancement of the overall story. That’s not a bad thing; it makes for a reasonable jumping on point for new readers (which as a comics retailer, I certainly appreciate, especially given the issue’s release proximity to Force Friday), but for those of us reading along, I’m left a little hungry for more. Still, Gillen’s gift for creating a highly entertaining supporting cast is on full display here, and distracts from the issue’s otherwise slightly sedate pace. The amusing bizarro trio of Aphra (chaotic-neutral Lara Croft in space) and murder droids Beetee and Triple-Zero get some “screen time” to shine, and the presence of Vader’s new adjutant, Inspector Thanoth (Imperial Sherlock Holmes) is a hoot. Thanoth’s quiet, methodical investigation into the raid and theft of currency from an Imperial vessel—a raid conducted by Vader, as part of his conspiracy to one day topple the Emperor—is a very effective dramatic counterpoint to the Sith Lord’s more overt menace. The guy’s got a cane and a monocle, and he still manages to be a threat to Darth Vader. High marks. Each issue heals the Attack of the Clones scars just a little bit more. Eric Trautmann is a writer and graphic designer with extensive credits for DC Comics, Image Comics, and Dynamite Entertainment. I’ve loved the current direction of the Superman books. A flawed, fallible Superman, weaker both physically and psychologically by the reveal of his secret identity. A Superman returning to his underdog roots, one who’s discovering the pain and joy of being almost human. It’s a story we’ve never seen before, which is impressive after decades of Superman stories. So I’m not sure if I’ve just gotten spoiled these past few months or if I’m splitting hairs or what, but this issue didn’t sit quite as well with me as the beginning of the arc. 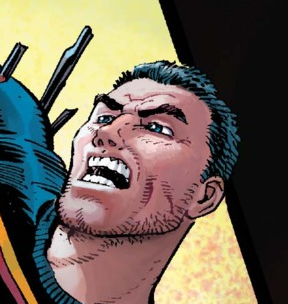 Kuder and Porter’s art is still great, bringing a raw physicality to the Man of Steel. There’s still plenty of aspirational content, from Superman and his friends, which is a must in a book like this. But the shift in direction—from a “cops vs. protestors” story to one where everyone’s shooting at shadow demons—rings a little hollow to me. There’s been a wave of stories recently grappling with real life issues of inequality, police brutality and corruption, and the general structural issues in America that have become impossible to ignore. You see it in this arc, you see it in this week’s incredible issue of Batman, and you see it books like Mighty Avengers. But while taking the corruption in the Metropolis police department and turning it into a physical character keeps the book more comfortably superheroic, it dilutes the story back to metaphor. I don’t know exactly what I want, here. I know Superman beating up thinly veiled surrogates for Darren Wilson or George Zimmerman and delivering lengthy diatribes doesn’t make for great storytelling. But in those decades of Superman stories, he’s gone toe to toe with slum lords and the Ku Klux Klan. There’s precedent for it without receding to monster stories, even as well-drawn as these monsters are. I think shifting away from the realism and towards fantasy was a mistake, but I still like this series a lot. Pak and Kuder have a solid handle on a Superman who’s still a champion of justice, but one that we (and he himself) are also just getting to know. With the exception of the comic book villains, the characters are understandable and relatable, even in their anger at the Man of Steel. I hope the creators don’t pull any more punches going forward. The Superman they’re crafting wouldn’t. Do you ever stop and think about the veritable renaissance that we’re experiencing with Star Wars this year? I’m having a lot of fun and I hope you are too (if you’re not having fun, look up videos of puppies playing with the new BB-8 toys). Now that we’re in the home stretch, only months away from The Force Awakens, Marvel is releasing the much-anticipated story that bridges the old and the new, and the best part is that they put Greg Rucka at the helm. GREG RUCKA, you guys. A Star Wars comic written by one of my favorite authors with the soft, nostalgic cover art of Phil Noto—I may actually cry. Anyway, Shattered Empire picks up at the end of the Battle of Endor (a.k.a. the finale of Return of the Jedi), but broadens the focus on Luke, Leia, and Han to include the pilots they command. One of those pilots is a badass lady with a cool scar, Shara Bey, who is married to another pilot, Kes, that happens to share a last name with a character from The Force Awakens (you can probably guess who but I won’t spoil it). Shara and Kes are part of a team led by Han who are on post-battle cleanup duty on the forest moon, but they soon discover intel that the war may not be over just yet… Rucka’s character-driven writing pairs nicely with the art team’s ability to knock your socks off with a gorgeous splash page. The comic opens in the middle of the climactic space battle around Endor, including the iconic lightsaber fight between Luke and Vader, and artist Marco Checchetto manages to capture all of the excitement and intensity of the film in the first few pages. Andres Mossa’s gorgeous colors make all of the explosions bright and cinematic as well—he even tosses in a little lens flare here and there to emphasize the outer spaceness of it all. The spectacle mixed with the intimacy of the character relationships make for an extremely well-balanced installment, and it also makes it easy to overlook the sometimes stiff and wooden appearance of the characters when they are the main focus in a panel. 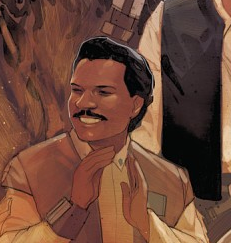 The only disappointing thing about Shattered Empire is that it’s a limited series, clocking in a four issues, but the good news is that it’s going to lead us right up to the premiere of The Force Awakens. So while we wait for the film event of the year (nay, the decade), we’re blessed with a stellar story that puts some long overdue focus on X-Wing (and A-Wing) pilots and establishes a new, strong family legacy (so strong that I’m pretty sure a Force Awakens character was conceived on Endor) in the Star Wars U.